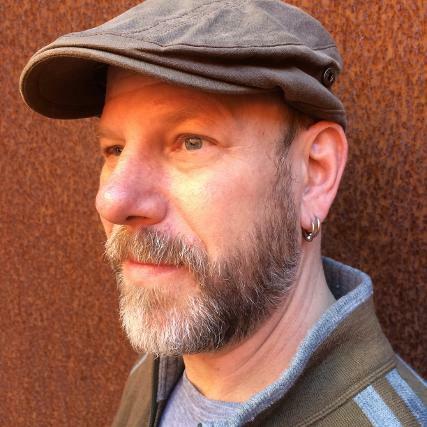 Matthew Cooperman is the author of, most recently NOS, disorder not otherwise specified (with Aby Kaupang, Futurepoem, 2018) and Spool (Free Verse Editions/Parlor Press, 2016), winner of the New Measure Prize. Other works include the image + text collaboration Imago for the Fallen World (w/Marius Lehene, Jaded Ibis, 2013), Still: of the Earth as the Ark which Does Not Move (Counterpath Press, 2011), DaZE, (Salt Publishing Ltd, 2006) and A Sacrificial Zinc (Pleiades/LSU, 2001), which won the Lena-Miles Wever Todd Prize. He’s also the author of five chapbooks: Disorder 299.00 (w/ Aby Kaupang, Essay Press, 2016), Little Spool (winner of the 2014 Pavement Saw Prize), Still: (to be) Perpetual (Dove | Tail, 2007), Words About James (Phylum Press, 2005), and Surge (Kent State University Press, 1998). Recent poems have appeared in such journals as American Letters & Commentary, New American Writing, Verse, Boston Review, Octopus, Lana Turner, Conduit, Pleiades, VOLT, Pool, Kenyon Review, Denver Quarterly, ecopoetics, Seattle Review and LIT. Nominated for five Pushcart Prizes, he is the recipient of the Jovanovich Prize from the University of Colorado, an INTRO Award from the Academy of American Poets, the Utah Wilderness Society Prize, and the O. Marvin Lewis Award from Weber Studies. A founding editor of Quarter After Eight, and former Fine Arts Work Center Fellow, he is a Poetry Editor for Colorado Review. Cooperman holds a B.A. in English from Colgate University, an M.A. in Creative Writing from the University of Colorado, Boulder, and a Ph.D in English from Ohio University. Cooperman has taught at Cornell College in Iowa; the University of Colorado in Boulder; Ohio University and Harvard University. He currently teaches creative writing and literature at Colorado State University, and lives in Fort Collins with his wife, the poet Aby Kaupang, and their two children.